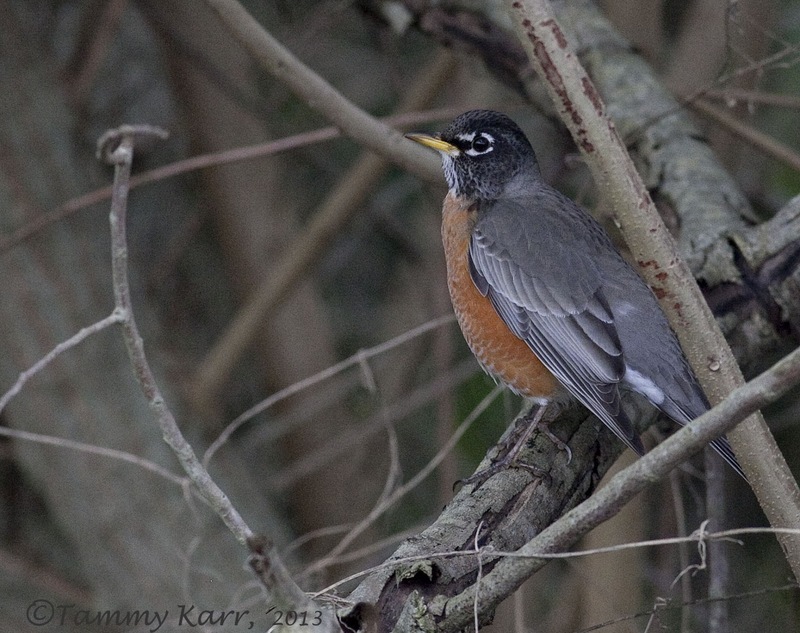 American Robin.....On Sunday, I saw the normal winter mass of American Robins feeding on the Brazilian Pepper berries at the ponds. As I was scanning the mass, I noticed one particular Robin stood out from the group. 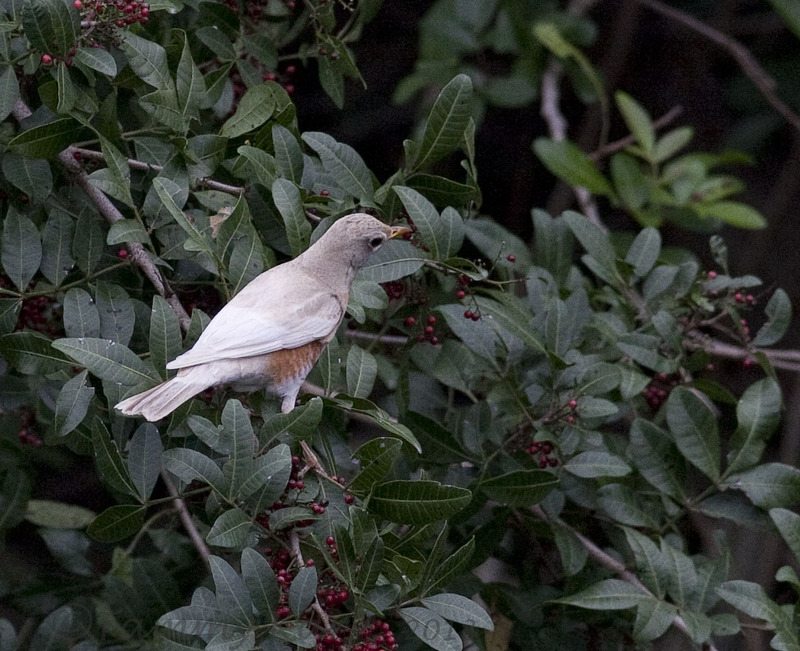 It was this leucistic Robin whose very light coloring stood out against the dark leaves. This was the first time I've seen a Robin with this condition. White Ibis...On Monday morning, the not so typically hued bird sightings continued. I was pulling out of a parking lot, 7-11 of all places, when a brightly colored bird among a group of White Ibis caught my eye. My view was somewhat obstructed and my first thought was what in the world is a Spoonbill doing foraging in the mulch??? I decided to go back and take a closer look. It turned out to be a "Pink" Ibis, a White Ibis with some Scarlet mixed in there somewhere. I had never seen one these before, but it turns out these are seen around Florida from time to time. The Ibis with the lizard cracked me up. There was actually a little lizard tug-a-war going on between an adult and juvi before I took this photo, but I didn't have my camera out of the bag yet. Well, Tuesday came along and it was back to work and back to the normally hued birds!!! Lovely photo's and a good post Tammy. Subjects well spotted. The robin really sticks out and the pink Ibis is really attractive. Superb photographs, Tammy. Cool find on the leucistic Robin. And the pink Ibis is beautiful another great sighting. Awesome photos! You were in the right place at the right time!! As always, your photos are exquisite! Tammy, both birds are great finds! The Robin is lovely with paler coloration and that Ibis just makes me smile, what a beauty! Wow, awesome! I didn't know that the ibises intermingled like that- very cool. that pink is amazing! so soft! i like it! thanks for sharing these rarities. Great observations! Not only a keen eye and good timing, but great technical skills to capture it all! That's great you recorded two unusual sightings in a short period of time! I've never seen a robin like that. I probably wouldn't have thought much about the Ibis just because we don't have them, but the pink is rather beautiful. Gostei dos Ibis, dessa côr por cá(Portugal) só se forem leucisticos como o Tordo! Beautiful birdpictures Tammy , poor Lizard but that´s nature ! Very curious pink Ibis, Tammy, could this a hybrid? Love them, the Robin and the Ibis are so good, beauty of being a birdlife like Tammy. Wow amazing that you saw those two birds on the same day. That was great, good job. Hermosas aves, Tammy , en la ultima toma la pillaste en pleno almuerzo. 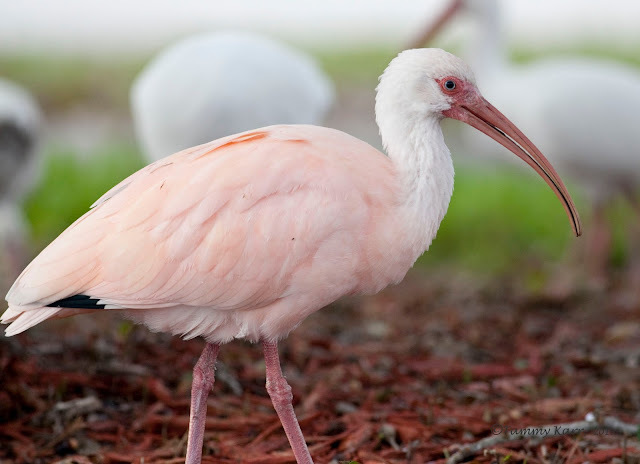 Pink Ibis?! Ive not seen pictures of these before, nice find. That robin looks great. My last leucistic bird happened to be on Key West...a completely white Turkey Vulture! I pretty much lost it. Isn't it amazing how your eye picks up subtle differences before you're actually aware of them. I find myself searching and scanning an area trying to figure out what my eyes have told my brain they've seen. I love that feeling :) Great captures of both birds Tammy. Really interesting on that ibis. It's really pretty. We have a cattle egret over here with light grey feathers everyone is trying to figure out. Fantastic finds and wonderful photos. 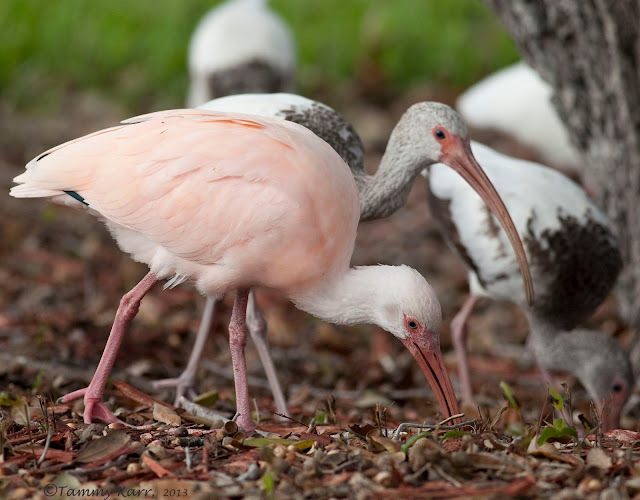 Too bad I'm colorblind--I can only barely see that your Ibis is pink, and I probably wouldn't have noticed it being different if you didn't tell me. The Robin is great too. My last leucistic bird was a Blue-gray Gnatcather. Tammy, you continue to excite and enlighten me with the extraordinary birds you find. 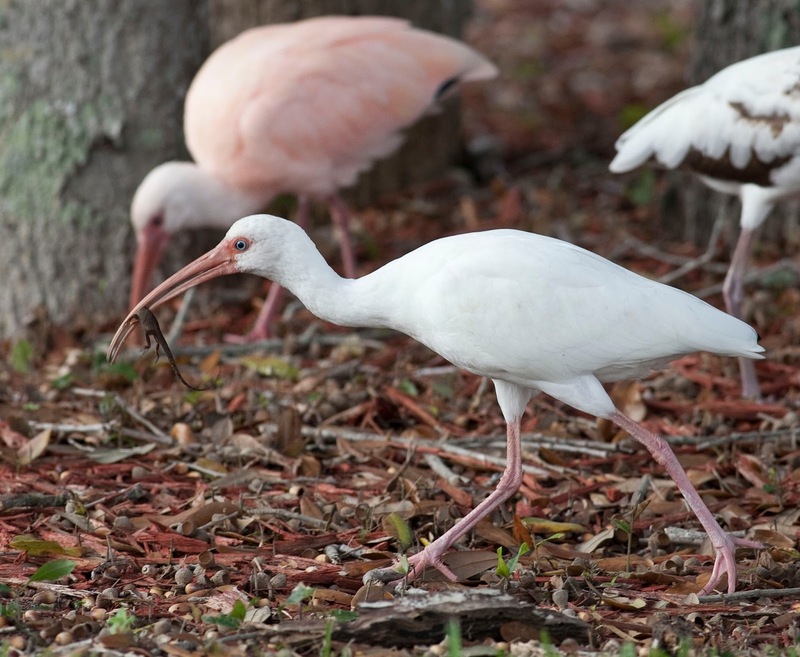 Both the leucistic Robin and pink Ibis are supercalifragilistic birds to add to your life-list. You changed your header shot. I like it! Nr 2 is my favourite this time, but the post with the gulls was extraordinary with picture nr 2. Great work cathing them in the air ! Have a nice week Tammy. Preciosas fotos Tammy y preciosas aves. I love the soft pink of those birds. So pretty! How lucky for you to see these unusual sightings two days in a row. Very cool looking robin and the plumage on the ibis is absolutely exquisite. Wonderful captures, Tammy! Awesome Tammy, two first timers for you. How good is that. Congrats. Bonito blog e interesante,con tu permiso te agrego al mio,y te seguiré desde hoy. Brilliant 2X birds, to get one is an achievement, but, to get another is a miracle. Well done Tammy. Quite incredible images of unusually coloured birds! It must be interesting to study the percentage of those and try to understand if it just genetic or if our "pollution" is responsable for some of these change. I have noticed blue frogs insted of green around where I live, a rare condition too.